Your hen party will be racing on an outdoor kart circuit in go-karts that are capable of 70mph. You will be driving head to head on a circuit that has been designed with speed and overtaking in mind and there will be plenty of hairpins, sweeping bends, a fly-over and long fast straights to challenge your driving skills. Your group will take part in an exciting Arrive and Drive session, which will include 3 x 10 minute head to head races with your group. At the end of the race you will all receive your lap times so there will be no doubt as to who the best drivers were. Alternatively you could upgrade your group to the F1 race format. This is an open event that takes place twice a day and includes a practice lap, 5 qualification laps and then a thrilling 15 lap race around the full 1300m circuit. This format is highly recommended to groups with a competitive streak! 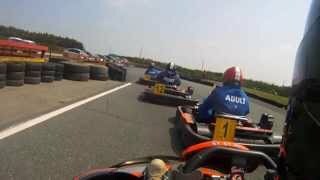 View our Outdoor Karting video and get an idea of what to expect on this activity.